Celebration time for Glenavon's Andy McGrory against Cliftonville. Pic by PressEye Ltd.
Glenavon eased to three points at Solitude with a 3-1 win - as Cliftonville’s post-Gerard Lyttle era began with something of a whimper. 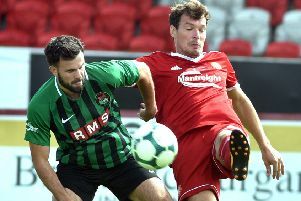 While their former boss was being unveiled as Sligo Rovers’ new manager, the Reds – under the guidance of Mal Donaghy and George McMullan – fell to a defeat that threatens their chances of home advantage in the forthcoming Europa League play-offs. Andy Hall nodded Glenavon ahead on 29 minutes and a howler from home keeper Peter Burke allowed Hall to double his tally on the hour. Martin Donnelly’s free-kick reduced the arrears but there was to be no late rally from the Reds, who fell further behind seven minutes from time when Andy McGrory smashed home an unstoppable strike after seeing his initial free-kick charged down by the defensive wall. The Lurgan Blues already know their play-off semi-final commitments will amount to a trip to whichever side finishes fifth in the table - and, now level on points with Ballymena United, Cliftonville must make sure they equal or better the Sky Blues’ result next week if they are to avoid a quick return clash with Gary Hamilton’s men. CLIFTONVILLE: Burke, McGovern, Ives, Bonner, Curran, Garrett, J.Donnelly, Cosgrove, A.Donnelly, Finnegan, Nelson. Subs: Dunne, M.Donnelly (A.Donnelly, 46 mins), Seydak, Lavery (Finnegan, 61 mins), Reynolds (J.Donnelly, 72 mins). GLENAVON: Tuffey, Neill, Kelly, Kilmartin, Hall, Doyle, McGrory, Turner, Singleton, Bates, Jenkins. Subs: Marron (Kelly, 46 mins), Moorhouse (Jenkins, 78 mins), Norton (Turner, 46 mins), Gray, Renato.